Artificial Intelligence (AI) has finally arrived to the majority of boardrooms. With leaders across the board discussing the potential challenges that the technology poses and how it will take true leadership to integrate the Artificial Intelligence technology to improve their effectiveness and enhancing the human capabilities further. In the age of AI, the leaders will be working with Man and Machines both, and to get best out of machines, the leaders must know its capabilities just as they need to know the capabilities of humans working for them. 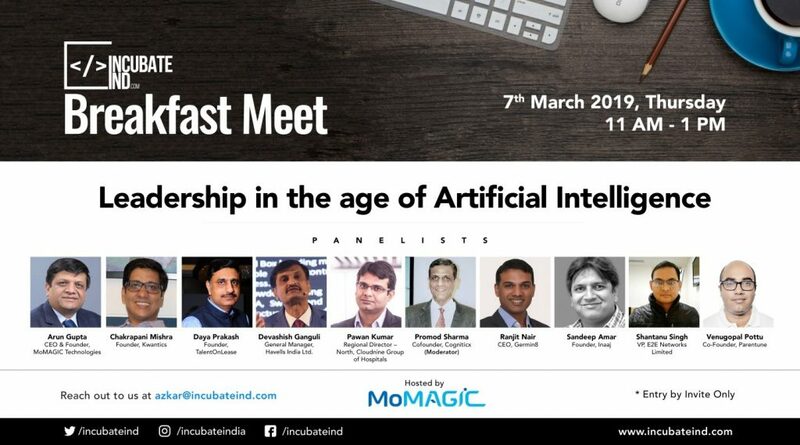 To address this burning topic that potentially can change us forever, MoMAGIC Technologies and IncubateIND got together to discuss the topic “Leadership in the age of Artificial Intelligence” and got some special speakers from various industries. Mr. Devashish Ganguli, General Manager, Havells India Ltd.